Valentine’s Day in the yard, and even though it’s cold and raining out, the feeling of love is all around. Ok, maybe it’s only emanating from Matt and I. Not because we’re so in love (although we are), but because Serendipity is literally being pieced back together. After a few delays getting the keel on earlier this week due to bad weather, we’re finally going to have a boat again that can move through water. 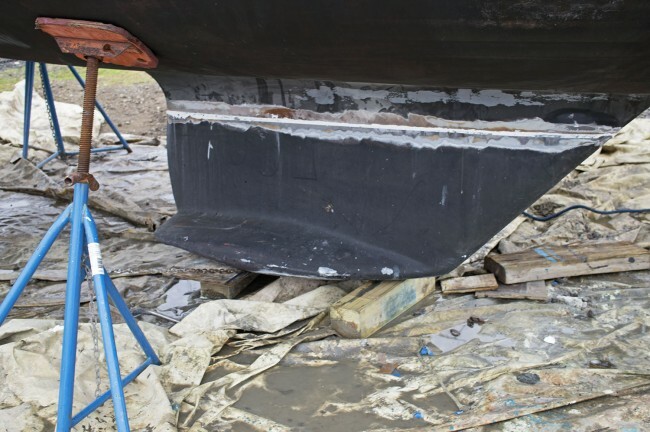 The skies were still a little gray this morning, and when we woke up we had no idea that the keel was still planned to be put on, thinking that any chance of rain might keep the 3M 5200 compound from setting. This is what’s getting slabbed on in the cracks, a VERY strong adhesive, so it was important to us that it set properly. We were actually sitting on the settees when I saw the travel lift on the side of the boat, and I thought they were putting in a new boat next to us. But then my mind comprehended that there is no space for another boat next to us on our port side, and so I looked over to starboard and saw the other side of the lift on that side. We quickly hopped up and raced out onto the deck. I don’t know why I only thought this would be a 1o minute job, but I did, so only grabbing a fleece and slipping on my flip flops, I climbed down the ladder. Getting a little snap happy with my camera, I started treating it like my kid’s first day of school, taking a million photos and hitting the record button each time the engine on the lift would fire up. 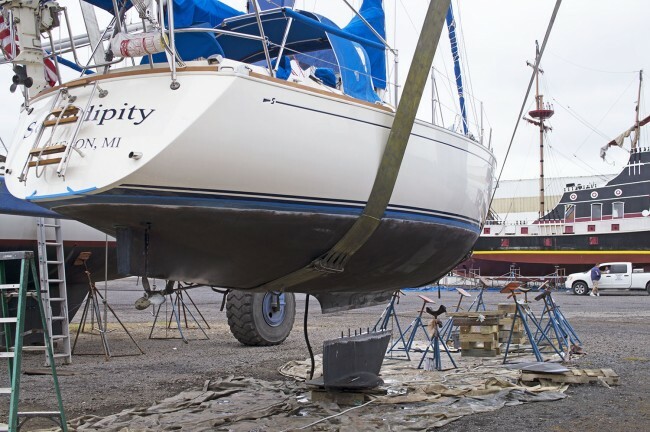 They got her up in the air pretty quickly, but then there was a lot of other work to be done on their end before the keel could actually go back on. We stood there for a few minutes, kicking at the sand, without much to do. Starting to take a little walk around the yard, I realized that we hadn’t eaten all day (I was just starting to fix lunch when the travel lift came) and I needed to have food. Well of course in our rush to get the process started we had left our bike keys up on the nav station, and now with Serendipity hovering 15 feet in the air with no ladder attached….walking seemed like the only option. Except our boatyard is a mile from the main drag in the historic part of town, and the only thing there is a Subway. Not that I think a one mile walk is out of the question, but I knew on foot it would take me close to 45 minutes round trip, and I didn’t want to miss out on any of the action of the keel going back on. I had almost resigned myself to hearing my stomach growl for the next hour or two when we remembered that our friends Patty and Terry had left another bicycle to the yard, after it had taken a little dip in the ocean, and Patty replaced it with a new and fully working one. We weren’t sure about the brakes, that were now supposedly a little suspicious, but it wasn’t locked and I only needed to take it down a dirt rode. Walking it from the shed into the yard, I tried to have Matt lower the seat for me, but that was also now a little rusted and not going anywhere. I figured I’d stand if necessary, but I needed my food, and I needed it quick. Getting out to the road I noticed the tires were also nearly flat, making this a very, very difficult bike ride. I was tempted to set it on the side of the road and start walking instead, but even this slow flat tire bicycling was faster than my walking. When I got into the Subway I was so sweaty and out of breath that the guy behind the counter had to ask me if I was alright. But after a few minutes of panting I was able to get my order out, and upon receiving my sub it was back to the bike for the exhausting conclusion of my ride. 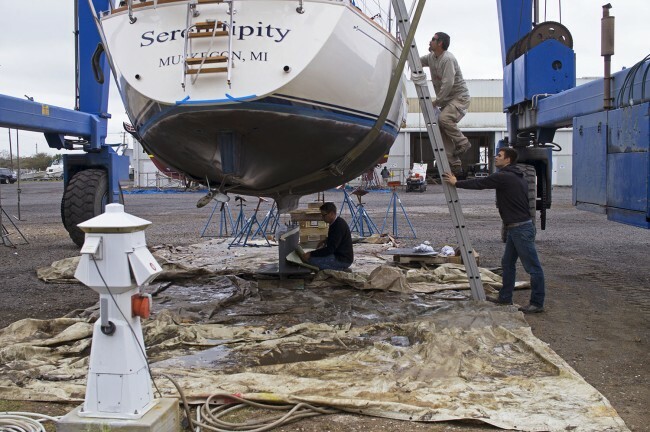 Arriving back at the yard I found Matt hovering by Serendipity, watching as a thick, gloopy coat of 5200 was spread across the keel. We took our sandwich to the picnic table which was just out of the howling winds that were beginning to pick up, and kept stealing glances over to our boat to see if anything big was about to happen. Nothing did while we were eating, so when we finished, we wandered back over to check on progress. There was a light drizzle coming down now, and our big fear that the adhesive compound wouldn’t set was coming back up, but we were assured that it would be fine, although it put a giddy-up in their step, and work was happening much quicker now. Wanting to make sure everything was still completed today, Matt asked if the rudder was still going on, since no one was paying much attention to it. It was probably a project they were going to save for the very end, but with the rain coming down now, we wanted to make sure it wasn’t skipped in lieu of getting out of that rain. The guy working the keel assigned two other guys to work on the rudder, one to lift the boat back up a little, and one to position the keel for when it came back down. Yes, visible progress again! 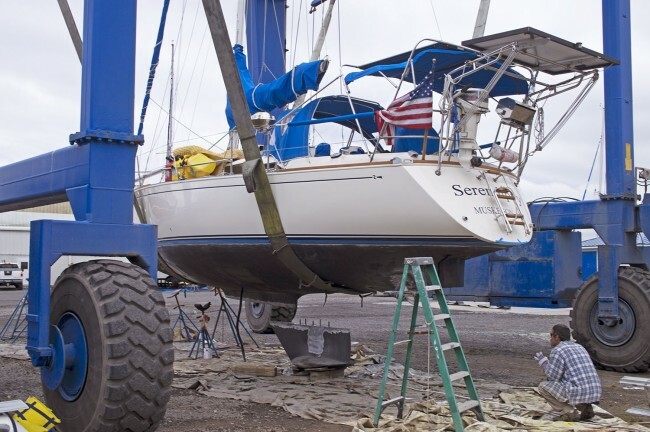 It wasn’t long after that the keel was now ready and with the travel lift up and running again, and a few hand signals, Serendipity was placed back down perfectly on top of the keel that she had been missing for a month. 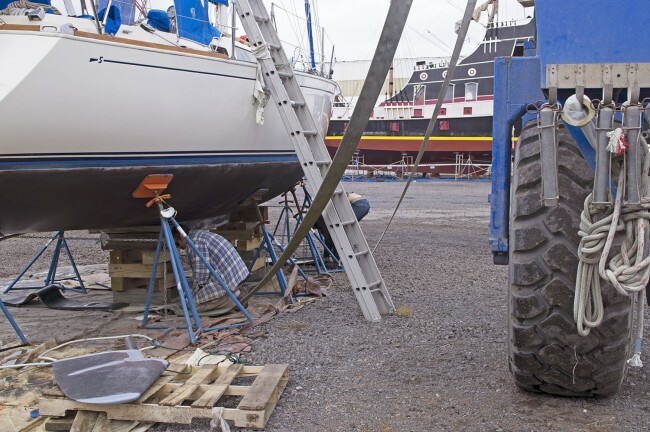 There was still the work of getting all the bolts tightened, nothing that we could help with or even see, since all the work would be done on the boat, so we went to the office to get warmed up. I couldn’t watch the rest the rest of the work, but I was still as happy as could be. I can actually taste how close we are to leaving now. Getting Serendipity put back together was the best Valentine’s gift I could ask for. It definitely beats out the Valentine’s Day a few years ago where we spent the evening running speaker wire for our home theater system. Looks like some good work. I read somewhere that 5200 can cure even underwater so a little rain probably wouldn’t be much different. 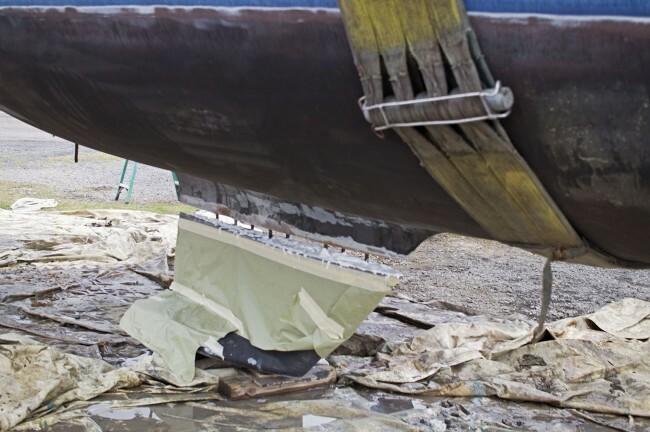 I saw something recetly that someone wanted to rebed their keel thinking it was needed and the bolts might have needed some work too only to find the bolts were still good and the 5200 used before still held the keel to the boat. I’ve heard it’s some pretty strong stuff. looking good! Have you guys set a launch date yet? Looks like the boat work is coming along, which is great! When do you guys think you’ll be ready to drop her in the drink again? We’re headed to Georgetown on Monday for the Cruiser’s Regatta… wish we could transport you here for it! P.s – sorry for the silence… internet access down here has been abysmal. I’m sitting in an internet cafe/restaurant/bar in Black Point right now catching up on months of people I couldn’t write to! Thanks Scott & Tasha! We have a launch date set for Tuesday, and we’re hoping that if the engine finishes it’s install on Monday (They still need to connect all the hoses), that we’ll still be on schedule for that date. We’ll probably stay around the marina for a day or two after, inspecting the boat in the water, but by Thursday we should be ready to leave! P.S. Tasha, don’t worry about it. 🙂 I’m glad that you still think of us with your abysmal internet time. 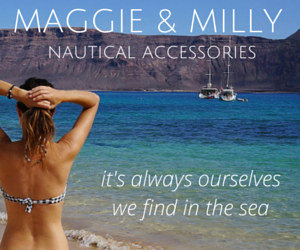 We wish we could transport ourselves to that Regatta too! have an negative effect on the effectiveness of the bottom paint? 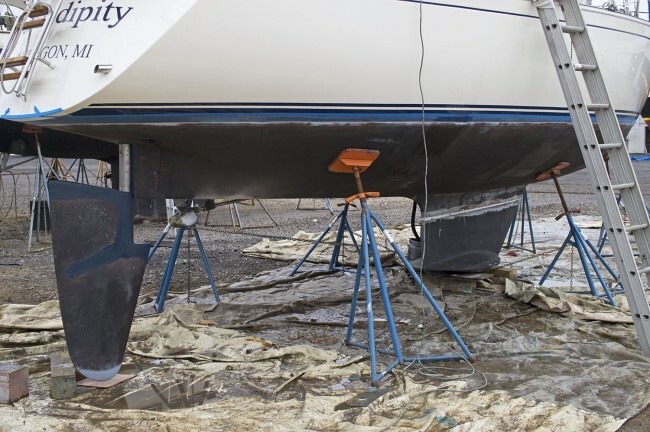 Jerry, since so much work was done to the bottom, we ended up having another coat of bottom paint put on the whole boat with double coats on the keel and rudder, plus where we raised the water line a little (we were sitting pretty low).